Shortbread is probably one of the easiest things to bake. It's basically three ingredients that have been mushed up together and popped into the oven to form bites of deliciousness. That being said, I added a few extra ingredients to these little guys to make them extra festive. These are my Christmas spiced shortbread biscuits, and I even cut them into star shapes to just add that extra seasonal touch. Through making these little guys though, I realised I really need some more biscuit cutters. I have a star and a moose, and really, there's not too much you do with those! So what makes this different from normal shortbread, you may ask. 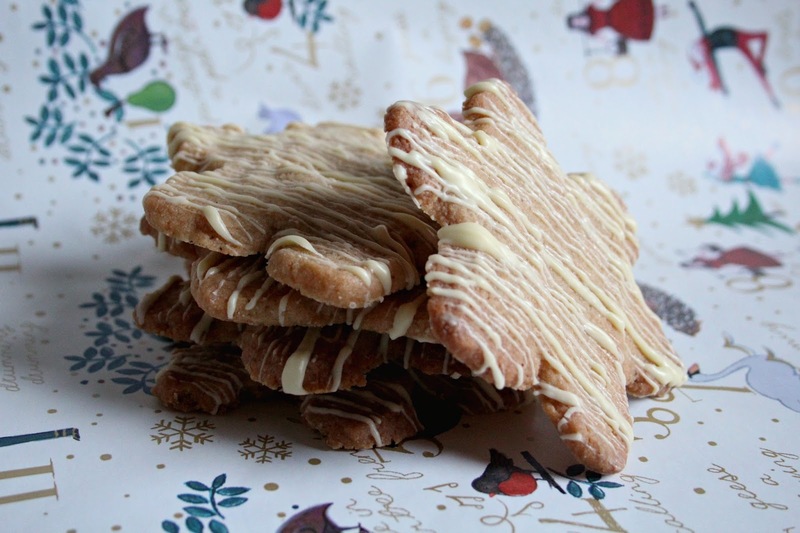 Well, I added in orange zest, cinnamon, nutmeg and ginger to give these biscuits a festive edge. There's nothing that tastes more Christmassy than orange and spices, is there? I also used brown sugar instead of caster to add a little more depth and to contrast against the spices. That's also why these biscuits look darker than the shortbread you'd see in shops. Trust me, it works BEAUTIFULLY. Preheat your oven to 170c and line 2 baking trays with greaseproof paper. In a mixing bowl, cream together the butter and sugar until light and fluffy. You can do this with an electric whisk or by hand! Sieve over the flour, spices and salt, then add in the orange zest before mixing on a low speed until just incorporated. You don't want it to form a dough here - the ingredients need to be just combined. Bring the dough together into a ball with your hands. Flour your surface and roll it out until it is about half an inch thick. You may need to cut it in half so that it fits on to both baking trays, and then refrigerate for about 15 minutes. This makes cutting easier and helps to stop major spreading in the oven. Once the dough had chilled for long enough, remove it and cut it into shapes. You could do traditional rectangles, or use cutters for something a little different. Place your shapes on to another lined baking tray or multiple trays, allowing room for spreading, and prick each one a few times with a fork. Bake for 15 - 20 minutes or until lightly golden. Once done, remove from the oven and allow them to cool for 10 minutes before transferring the biscuits to a wire rack. In a heatproof bowl over barely simmering water, melt down your white chocolate. You could also do this in the microwave if you wish! Once your biscuits have cooled and your chocolate has melted, drizzle the white chocolate over them generously. Then put them on the wire rack to set. It's that easy, but nobody else has to know. You can just impress them with how tasty they are! These would be great for a Christmas party, or as a little snack on Christmas Eve with a hot drink. You could try your hand at making royal icing to do fancy decorations if you don't like the idea of drizzled white chocolate. Or you could leave them plain for a nice, subtle look. Either way, you have to make these!